Silver-nanoparticles are more and more used not only in traditional antimicrobial applications but also in other interesting nanotechnology areas such as innovative nanostructures for green chemistry, disinfection of pathogenic microorganisms in agriculture fields and hospitals, nanomedicine and renewable clean energy processes like hydrogen production. The low-cost and practical synthesis methods of silver-nanoparticles, which are in contrast with those using noble and transition metals, are indeed a tangible alternative. These silver-nanoparticles cocatalysts are easy to prepare and inexpensive, and with mild condition methods, zero dimension (0D) to third dimension (3D) nanostructured particles can be obtained, whose size and shape can be modulated according to specific applications. 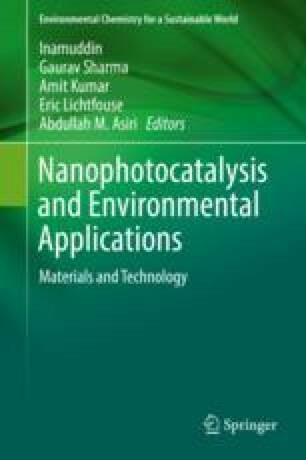 In this chapter, a practical review about the use of silver-nanoparticles in mesoporous and graphene-based materials and in coatings intended for photocatalytic applications is reported. Activity insights into the plasmonic effect, electron-hole mediator and bacteriostatic inhibition of pathogenic colonies at room temperature are provided. The oxidation state is also a significant factor for understanding the role played by silver-nanoparticles in the enhancement of nanotechnology and environmental photocatalytic applications. The discussion featured in this chapter is based on suitable examples from the literature concerning photoactive silver-nanoparticles functionalized on nanostructured materials.